Ever wonder where your outdoor cat wanders? “The cat is within 50 yards,” my companion, Vermont wildlife biologist Frosty Hammond, announced as he slowly swung what looked like a rooftop TV antenna in an arc, listening for a chirping sound. We were standing in a snowy driveway in Springfield, Vt. A few weeks earlier, Frosty had been tracking radio-collared black bears; I had been in India studying tigers. But the cat we were tracking together lived in the house at the end of the driveway: a 7-year-old, 14-pound black puffball named Darryl. Though tigers and bears still keep many secrets, the enigma of the suburban housecat remains more mysterious yet. In the 1950s, one of the world’s top experts on felines, German ethologist Paul Leyhausen, had tried to study the outdoor travels of Felis catus. To follow just one housecat “would have required three well-trained, physically fit, and inexhaustible observers, plus a lot more equipment than we could command at the time,” he later admitted. Frosty and I hoped for greater success. We had better equipment: We had obtained, from a company that normally supplied telemetry for studies of wolverines and cougars, a custom radio collar small enough for a housecat. We had a 400,000 candlepower searchlight. And we had Barbara Burns, a Vermont state forester, who had generously provided us with a detailed aerial map of the area we might cover, as well as our study subject. Darryl was one of her two cats, and by her account, spent most of his day asleep. But at night? We imagined hours of adventure. One English study showed female cats roamed up to 17 acres and males ranged over up to 148 acres. Because Darryl was neutered, it was unlikely he’d be seeking mates. But he could be fighting rivals, hunting prey, or being hunted himself. Nearly two decades after our Vermont evening, the mystery of cats’ outdoor travels remains. Our findings were not exactly revelatory. We encountered several problems — the most salient of which was, every time we went outside to track him, Darryl came to ask us to let him back in. But now, North Carolina researchers have launched the most ambitious effort yet to reveal the secrets of cats’ outdoor excursions. Using tiny satellite tracking harnesses, the Cat Tracker Project has enrolled more than 500 cats in a program that will outfit them with Global Positioning System devices — and if yours is an indoor-outdoor cat, your pet may be part of the study. Collaborating researchers at North Carolina State University, North Carolina Museum of Natural Sciences and the Bruce Museum in Greenwich, Conn., are hoping to get five days of travel data on 1,000 cats. They’re loaning equipment to cat owners in Fairfield, Conn., Long Island, N.Y., Westchester County, N.Y., and Raleigh/Durham, N.C. But they are also accepting DIY cat trackers. For instructions on how to participate, visit www.cats.yourwildlife.org. That’s one reason that the Humane Society of the US and the American Veterinary Association recommend we keep our cats inside. Another is that indoor cats live significantly longer — to 17 years or more — than those allowed to roam. 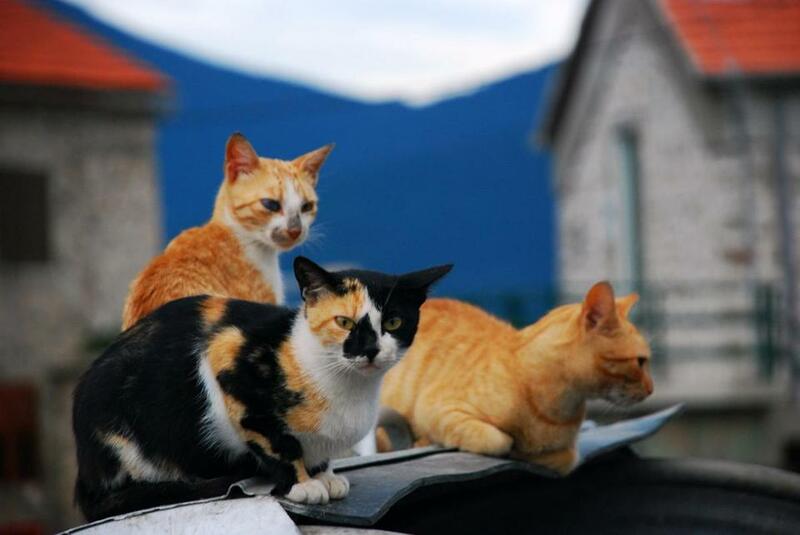 With an average lifespan of only two to five years, outdoor cats are apt to meet violent deaths: One study found 63 percent of recorded cat fatalities were caused by cars. Other outdoor cats die in the jaws and talons of predators or in combat with rival cats. They are also more likely to contract diseases such as feline AIDS or feline sarcoma virus. As for her own cats, Perkins has rescued two and re-homed them — where they both stay indoors. And Darryl? We did manage to glimpse some secrets that snowy night. Every time we emerged from the house with our telemetry, he tried to get back in. Finally, sometime after 10:30 p.m., we let him. But while we had been waiting inside, he had left fresh tracks in the snow. We followed his pawprints down a ravine, into a hemlock forest, over a snow bank, into a thicket. Here, he met another cat, then a third, and the three traveled together for some time. Sy Montgomery is a naturalist and an author. Send her questions at syandlizletters@gmail.com.